I’ve started to transcribe and reproduce information from W.D.F. 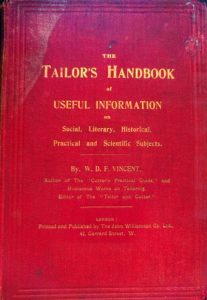 Vincent’s Tailor’s Handbook of Useful Information. Starting here with the Cover and Author’s Preface and separate article on The Noble Army of Tailors, I will add more as I get the time.